You'll be £40.00 closer to your next £10.00 credit when you purchase Victoria Crosses on the Western Front - Third Ypres 1917. What's this? 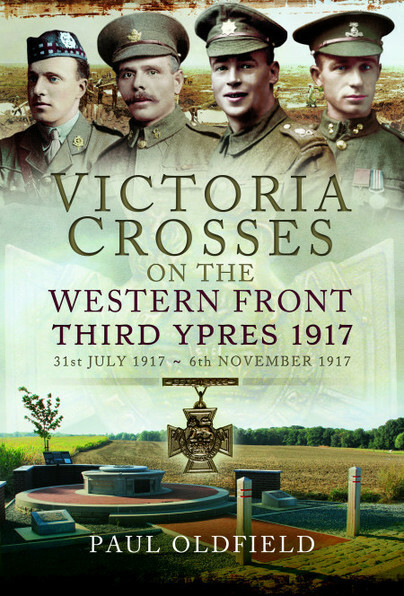 Victoria Crosses on the Western Front Third Ypres 1917 is designed for the battlefield visitor as much as the armchair reader. A thorough account of each VC action is set within the wider strategic and tactical context. Detailed sketch maps show the area today, together with the battle-lines and movements of the combatants. It will allow visitors to stand upon the spot, or very close to, where each VC was won. Photographs of the battle sites richly illustrate the accounts. There is also a comprehensive biography for each recipient, covering every aspect of their lives warts and all parents and siblings, education, civilian employment, military career, wife and children, death and burial/commemoration. A host of other information, much of it published for the first time, reveals some fascinating characters, with numerous links to many famous people and events. In this excellently written and researched work the author provides an account of each of the VC actions, setting them against a wider strategic and tactical context. He also provides a comprehensive biography for each of the VC recipients, covering every aspect of their lives. A wealth of information, much of it previously unpublished, reveals some fascinating characters with numerous links to many famous people and events. If you can afford it this is well worth adding to your Great War collection. A marvellous history, well recorded and supported with excellent photographs and maps. Oldfield's work is timeless, and I feel their longevity will endure given the continual interest that people will have in the Victoria Cross. Paul Oldfield has produced an exhaustive account of the Victoria Cross-winning actions in the Third Battle of Ypres, which was fought from 31 July to 6 November 1917. The illustrated guides to the combat will be particularly useful to battlefield visitors, and biographies of the decorated soldiers are included.